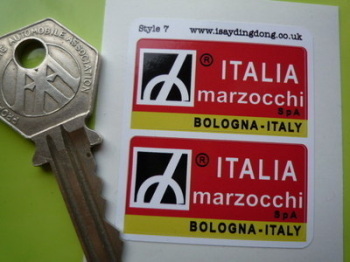 Marzocchi - I Say Ding Dong Shop - Buy Stickers, Decals & Unique Automobilia. Made in Italy. Gold or Silver Oblong Stickers. 2" Pair. Marzocchi Bologna Brevattato Stickers. 1.5" or 2.5" Pair. Marzocchi Bologna Italy Sticker. Set of 4. 1.5". Marzocchi Bologna Italy Yellow Background Stickers. 1.75" Pair. Marzocchi Circular Yellow Shock Absorber Stickers. 1.5" Pair. Marzocchi Cut Vinyl Stickers. Various Colours. 7" Pair. Marzocchi Fork Slider Black & Silver Stickers. 135mm Pair. Marzocchi Fork Slider Stickers. 4" or 6" Pair. 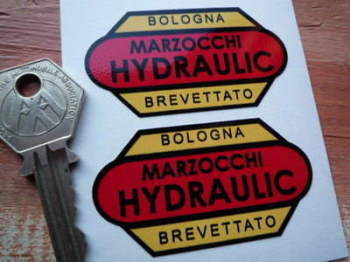 Marzocchi Hydraulic Bologna Brevattato Stickers. 2.5" Pair. Marzocchi Italia Suspension Stickers. 1.5" Pair. Marzocchi Kangaroo Style Stickers. 8" Pair. Marzocchi M1R Blue Frame & Outline Style White & Blue Clear Vinyl Stickers. 4.25" Pair. Marzocchi M1R Fork Slider Blue Detail Stickers. 4" Pair. Marzocchi M1R Fork Slider Green Detail Stickers. 4" Pair. Marzocchi M1R Printed White & Blue on Clear Vinyl Stickers. 4.25" Pair. Marzocchi Motorcycle Blue Stickers. 3" or 4" Pair. Marzocchi MX 5 80 Suspension Unit/Shock Absorber Stickers. 1.5" Pair. Marzocchi Racing Style White on Red Fork Slider Stickers. 6.75" Pair. Marzocchi Rainbow Tube Motorcross Bike Stickers. 3" Pair. Marzocchi Red on Clear Fork Slider Stickers. 5", 7" or 10" Pair. Marzocchi Red Text Fork Slider Stickers. 6.75" Pair. 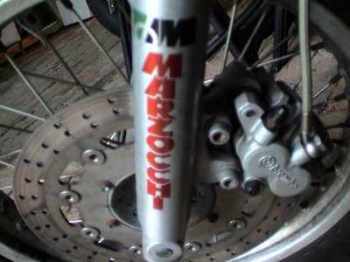 Marzocchi Suspension Stickers. 1.5" Pair. Marzocchi White & Black on Clear Fork Slider Stickers. 7" Pair. Marzocchi White & Blue on Clear Fork Slider Stickers. 5" or 7" Pair. Marzocchi White, Black, & Clear Sticker. 2.25". Marzocchi White, Black, & Clear Stickers. 2.25" Pair.